This four piece British act created a grand symphonic concept album based on the topic of God and the “Ten Commandments”. Centred around the organ laden swirls of Alister Benson who at times very much remind of Deep Purple’s Jon Lord. Conceptually on this album each of the ten songs focuses on one commandment. Salamander combine orchestra with rock not unlike in many ways the Moody Blues achieved on their early albums. Lead vocalist Dave Titley sounds very similar in style to Dave Lambert of the Strawbs and the vocal harmonies work to perfection. Instrumentally Salamander are tight and crisp with guitar, bass, drums and organ augmented with orchestration throughout. Originally released in 1969, Swiss band Shiver's sole self-produced album contained a wide range of psychedelic and progressive styles. Crudely recorded, and often shoddily played, it would seem to be an anthology recorded over a long period. It also contains both tracks that were issued as a single: “Hey Mr. Holy Man”/”The Peddle.” It also features the very first time the famous designer H. R. Giger delivered some of his art to become an album sleeve. Silverhead were a British band, fronted by singer/actor, Michael Des Barres. They recorded two studio albums, "Silverhead" (1972) and "16 and Savaged" (1973), and a live album that was only released in Japan after they had broken up. On the posthumous live album, Silverhead were caught live, and not realizing that they were being recorded when they opened up for Deep Purple. This performance shows that they were made for a live setting as you can hear the band ripping through their songs with energy and pure excitement. There was no shortage of good psychedelic albums emerging from England in 1967-1968, but Ogden's Nut Gone Flake is special even within their ranks. Overall, this was the ballsiest-sounding piece of full-length psychedelia to come out of England, and it rode the number one spot on the U.K. charts for six weeks in 1968, and it was the group's crowning achievement. The Small Faces' first album for Andrew Loog Oldham's Immediate label originally appeared in two different forms in England (where it was known as Small Faces) and America. The music here is much more fully developed and experimental than their preceding album, still largely R&B-based but with lots of unusual sounds and recording techniques being attempted. SHM-CD Vinyl Replica Paper Sleeve with 20 Bonus Tracks. 15-track CD album including the 5-track promotional-only CD single, originally issued by HMV with limited initial copies of the album, includes "Hope", "Blissed And Gone", "Apathy's Last Kiss", "Mayonaise [Acoustic]" and "Eye", custom card picture sleeve. Pre-SFF (Schicke Fuhrs Frohling) symphonic German prog offering some very tasty musical moments with tons of mellotron. In many ways I get a strong early GENESIS feel throughout this album which I think rests in the HACKETT'esque guitar solos with heavy mellotron laded backdrop atmospheres. The Laser's Edge have managed to also do a great job in re-mastering this ancient gem adding a live bonus track of over 20 Mins. The Spriguns (of Tolgus) were formed as a duo in 1972 by husband and wife,Mike and Mandy Morton playing traditional folk music not dis-similar to early Steeleye Span. Six months after the release of 'Jack With Feather', Mandy formed the new 'Spriguns', dropping the 'Of Tolgus' suffix and signing with Decca Records.The band recorded 'Revel Weird and Wild' in 1975 & released in 1976, which consisted of only of songs written by members of the band, although some of the songs were more or less stolen from traditional songs, produced by Tim Hart. The sound was becoming rockier but they hadn't forgotten their traditional roots just yet. Personally supervised by Bruce Springsteen and Jon Landau, the box set includes "Hammersmith Odeon, london '75," an astonishing film of Bruce Springsteen and the E Street Band's legendary 1975 concert at the Hammersmith Odeon in London; the new film "Wings for Wheels: The Making of Born to Run;" the classic album in remastered cd form; and finally, a 48 page booklet of previously unpublished photographs. With its two dvds, the package offers approximately four hours of previously unseen footage. Spanning roughly two hours and ten minutes, the November 18, 1975 concert at London's Hammersmith Odeon finds an epic performance of sixteen Bruce Springsteen classics, including "Thunder Road," "Tenth Avenue Freeze Out," "Jungleland," and "Born to Run", as well as such other favourites such as "Kitty's Back" and "Rosalita". The multiple-camera film of the complete concert will be available in its entirety and its original sequence, as newly edited by emmy award winner Thom Zimny. "Hammersmith Odeon, London '75" is the only full-length concert film ever released of Bruce and the E Street Band's first 25 years. The ninety-minute documentary "Wings for Wheels: The Making of Born to Run" chronicles the definitive story of the creation of Born to Run, from songwriting to production and beyond. "Wings for Wheels" boasts archival film never shown publicly, including substantial footage of Springsteen and the E Street Band recording the album, 1975 concert film and other footage shot between 1973 and 1975. The film also features exclusive footage of Springsteen playing solo piano and guitar versions of songs from Born to Run. THE PROMISE: THE DARKNESS ON THE EDGE OF TOWN STORY comprises over six hours of film and more than two hours of audio across 3 CDs and 3 Blu-rays. The music and film are packaged within an 80-page spiral-bound notebook containing facsimiles from Springsteen's own notebooks from the original recording sessions, which include alternate lyrics, song ideas, recording details, and personal notes in addition to a new essay by Springsteen and never-before-seen photographs. Containing a wealth of previously unreleased material, THE PROMISE: THE DARKNESS ON THE EDGE OF TOWN STORY offers an unprecedented look into Springsteen's creative process during a defining moment in his career. Culled from the two Madison Square Garden shows that closed out the revived E Street Band's 1999-2000 road show, this 20-song collection deftly entwines fan favorites with fresher material, including two new offerings, the stately "Land of Hope and Dreams" and the solemn "American Skin"--the latter prompted by the shooting of unarmed New Yorker Amadou Diallo by police officers. When Springsteen and company (including both Miami Steve van Zandt and his successor, Nils Lofgren, on guitar) look back, they temper the force of the original arrangements with ingenuity and a sense of spacing. The E Street Band in their heyday may have served up four-hour marathons, but they felt stopwatch-tight. Incl. a full colour booklet. "The Boston Godfather", contains all four concerts from The Boston Music Hall gigs in 1977. This was the last tour before Bruce started introducing material from the "Darkness on the Edge of Town" sessions. As with the no label releases, Godfather’s source for these shows is the recently torrented Steve Hopkins master tapes. CD1 & CD2: Music Hall, Boston, Ma, March 22, 1977. CD3 & CD4: Music Hall, Boston, Ma, March 23, 1977. CD5 & CD6: Music Hall, Boston, Ma, March 24, 1977. CD7, CD8 & CD9: Music Hall, Boston, Ma, March 25, 1977. This handsomely packaged box set goes a long way towards illuminating the darker corners of Springsteen's recording career. Apparently, almost every time the Boss went into the studio he recorded more songs than he could possibly fit onto a record, and most of those extra tracks languished in obscurity. The four-disc TRACKS aims to change that. The amazing thing about the never-before-heard material here (and the little-known b-sides also included) is that most of the songs are just as impressive as the ones ultimately chosen to go on Springsteen's albums. Starz' sophomore album was quite similar to its predecessor. Jack Douglas was still the band's producer, and Starz continued to favor the type of slick, commercial hard rock that would be called pop-metal in the '80s and early '90s. This 1977 LP didn't establish Starz as major players in the pop-metal field; the New Yorkers did have a small following, although not a huge one. Nonetheless, this is an enjoyable record. SHM-CD Vinyl Replica Paper Sleeve with 3 Bonus Tracks. If any single song sums up Status Quo in the hearts and the minds of the millions, it's "Down Down." Other songs may have been bigger, others may have more resonance, and some may be so permanently ingrained that it's hard to remember that Status Quo cut anything else. But, if you want to nail the very essence of Status Quo, only "Down Down" will do. Steel, Casino - Oh Boy! Norwegian singer Casino Steel (Stein Groven) was part of the UK punk scene with the Hollywood Brats and The Boys. In 1990 he met Mick Ronson when Ian Hunter and Mick appeared on a Swedish television show. Mick later returned to Stockholm to produce the Secret Mission album Strange Afternoon, and while he was there Casino called and suggested they work together. Mick moved in with Casino, and recorded an album with him entitled Casino Steel and the Bandits featuring Mick Ronson (Revolution REXCD03). The album was to be followed by a Bandits tour of Norway and Sweden in November 1991, but Mick's illness forced it to be canceled. In 1992, the album Oh Boy! (Revolution REXCD04) was issued and it was also credited to Casino Steel and the Bandits. It repeats much of the material from the earlier album, but adds three new songs that do not feature Mick Ronson. Original Out of Print Norwegian CD! "The Seventh Step" is the first solo contribution by Dirk Steffens, the former guitarist of the band "Birth Control". There are some excellent hard rock songs here and a fair amount amount of sweet electric solos to keep most of you hooked. Only 1500 copies of this CD was re-released back in 1995 and is therefore most rare indeed. Digipak. Steppenwolf gets back to basics on such Spinal Tap-esque titles as the funk rocker "Ball Crusher" and the instrumental "Earschplittenloudenboomer.". With "Snowblind Friend," the band revisits the cautionary drug tale originally laid down in their '60s anthem "The Pusher." The most lyrically interesting track on the album is definitely "Renegade," in which Steppenwolf singer/leader John Kay tells the autobiographical tale of how he and his family fled Nazi Germany during World War II. SHM-CD Vinyl Replica Paper Sleeve with 3 Bonus Track. 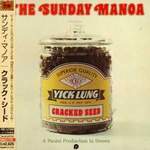 Sunday Manoa was founded by guitarist Peter Moon and two members of the Pahinui Brothers, Cyril and Bla. The group combined traditional Hawaiian slack guitar and percussion with a mainland-influenced rock inflection: the product of Moon's education in North America. The group's Cracked Seed, issued in the 1972, sold an unprecedented 30,000 copies in Hawaii alone.